The CPCBS is a suite of benchmarks using real-world and open-source applications to simulate how PCs are actually used. The suite comprises an image editing test using Gimp, a video encoding test using Handbrake, and a multi-tasking test using 7-Zip to archive and encrypt a large batch of files while an HD movie plays in mplayer. A score of 1,000 means that the test system is as fast as a reference PC, which used a 2.66GHz Intel Core 2 Duo E6750 at stock speed, 2GB of Corsair 1,066MHz DDR2 memory, a 250GB Samsung SpinPoint P120S hard disk and an Asus P5K Deluxe WiFi-AP motherboard. The scoring system is linear, so a system scoring 1,200 points is 20 per cent faster than the reference system. Equally, a system scoring 1,200 is 4 per cent faster than a system scoring 1,150. I love your "No BS" builds, Paul B)/> .....at some point, we'll have to chat about cars. holy cow man i only scored a 1392... but thats what i get for choosing bulldozer lol. its does everything i need it to though! What memory are you running? AMD CPU's benefit from high bandwidth memory normally the faster the better. Sandy Bridge CPU's respond to latency more so than bandwidth as regards memory, this has come from hands on experience with no less than 1 x P67, 1 x Z68 and 2 x Z77 motherboards (I'm on Z77 board number 3 now with the Gene V lol) and 4 different memory sets (both 2 x 2Gb and 2 x 4Gb). My own memory set runs at 2133MHz (it's rated at 2200MHz) with 8-8-8-21 1T timings (2 x 2Gb) or I can also run it at 1866MHz with 7-7-7-17 1T timings; eitherway it has plenty of headroom which is why I can successfully and stably utilize the option of BCLK increases also. 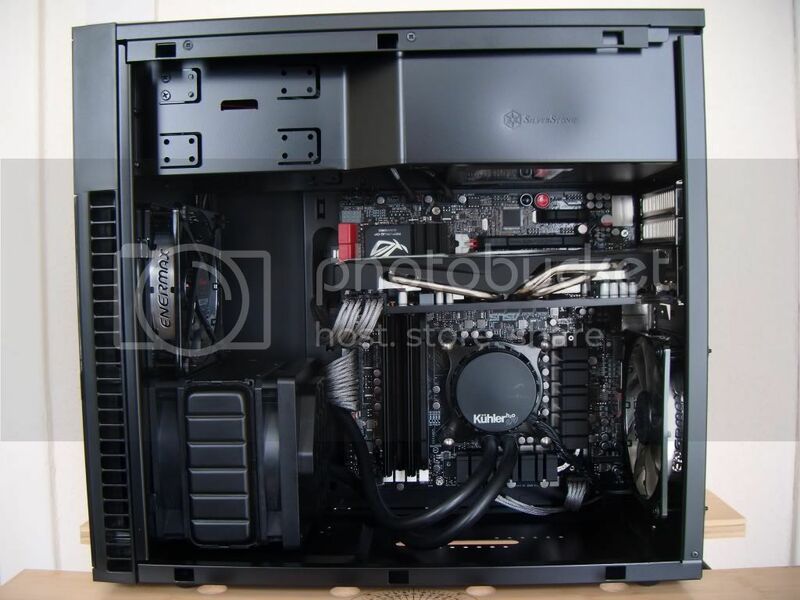 The CPU in question celebrates it's 2nd birthday in March (sad I know lol), a typical i7 2600K retails for around £208 ($333/€256); I was offered £450 ($722/€556) for my own by an overclocking enthusiast just a couple of weeks ago (I said no). 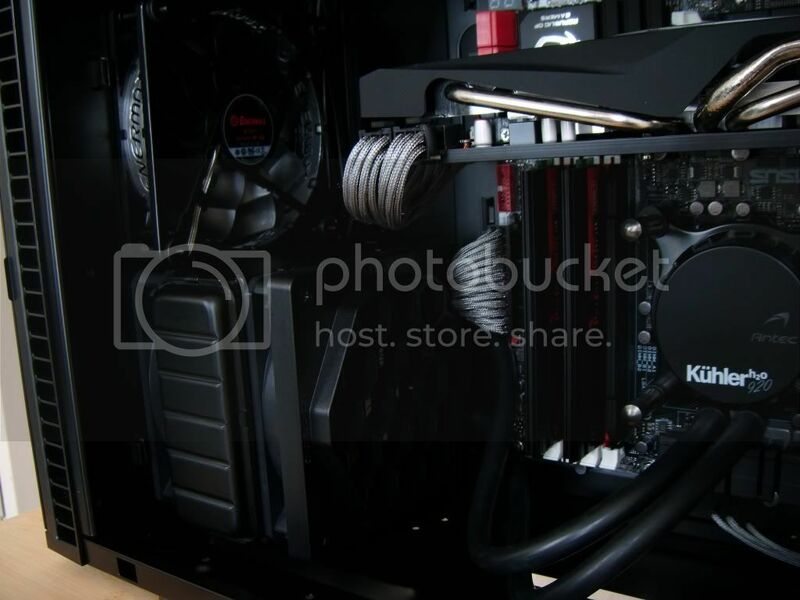 Good choice of components, the only thing I would suggest were funds to allow you to do so is grab some faster memory; you would see a noticeable an improvement in most things as AMD processors love bandwidth. hey no problem on the time thing, heal up! either way im not an extreme benchmark enthusiast and my pc functions as intended. so these upgrades are not mandatory but will happen "eventually"! I'd go with the Sabertooth personally, the Intel equivalents are absolutely superb! I know this thread is a bit old but I thought I'd try this benchmark just out of interest. It would appear that the program is optimized for dual core processors so a lower core count will yield better over all results. The photo editing could only utilize 1/8 cores in my FX8350 and the max processor usage at any tine was 42% so my end result was a bit of a disappointment at first glance! I try to run and it keeps failing. Is this not compatible with Win8? <_< Your probably right ha ha. My only suggestion would be to install it as Administrator and once installed edit the properties of the shortcut so it runs with Administrator rights also. Ah I know ha ha. Its gonna be a while before it opens up to more software. I was a little too ahead of the game on purchasing it. Sorry Mate I posted that in the wrong place. Started my own thread. Old timers disease! very nice man...! i just got curious and got to crackin around in my bios same components as last year new graphics card and case tho running a 7870 instead of 550ti i say new but i got it around christmas last year. running windows 8 instead of 7 this time around 4.8 ghs overclock on the fx 4170 cpu and went and overclocked my ram aswell managed to hit 1866 on a set of 8 gb kingston 1600 ram just playing with the timings a bit. beat my old score of 1420 by a fair margin. My poor ol shop PC put up a whopping 800! Intel dual core and GTX9800 (I think). 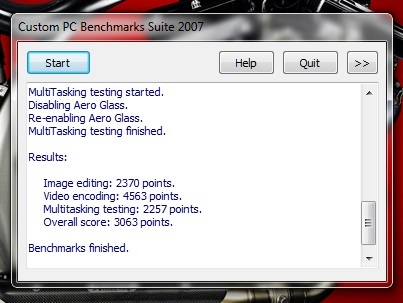 Old benchmark software more powerful then I thought it would be. Just to highlight, The CPCBS 2007 were developed as a suite of benchmarks using real-world and open-source applications to simulate how PCs are actually used. 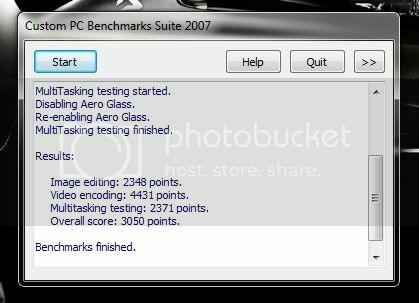 The suite comprises an image editing test using Gimp, a video encoding test using Handbrake, and a multi-tasking test using 7-Zip to archive and encrypt a large batch of files while a HD movie plays in mplayer. 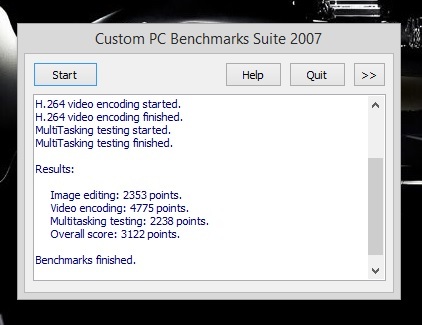 A score of 1,000 means that the test system is as fast as our reference PC, which used a 2.66GHz Intel Core 2 Duo E6750 at stock speed, 2GB of Corsair 1,066MHz DDR2 memory, a 250GB Samsung SpinPoint P120S hard disk and an Asus P5K Deluxe WiFi-AP motherboard. The scoring is linear, so a system scoring 1,200 points is 20 per cent faster than our reference system. Equally, a system scoring 1,200 is 4 per cent faster than a system scoring 1,150. I have a HUGE soft spot for the ASRock boards (very very underrated bits of kit), in recent times I've owned both the Z77 E-ITX and a Z77 Extreme4 and loved both of them; they overclock like b*tches on heat also!! !